I’m not sure I get this one. So, you’re the current dealer in your weekly poker game. 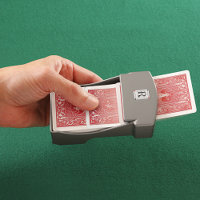 You shuffle the cards and right before you deal, you stick the deck in this shooter gizmo, and zing the cards to each player. Is the idea to lodge a card in the player’s neck, leaving you as the last player? This device deals cards to players up to 3′ feet away without flipped cards. It holds an entire deck of playing cards, and when you advance a card with your thumb, a pair of 1″ diameter foam wheels spin, gently gripping the card and launching it horizontally. Cards are dealt as quickly as you can move your thumb.